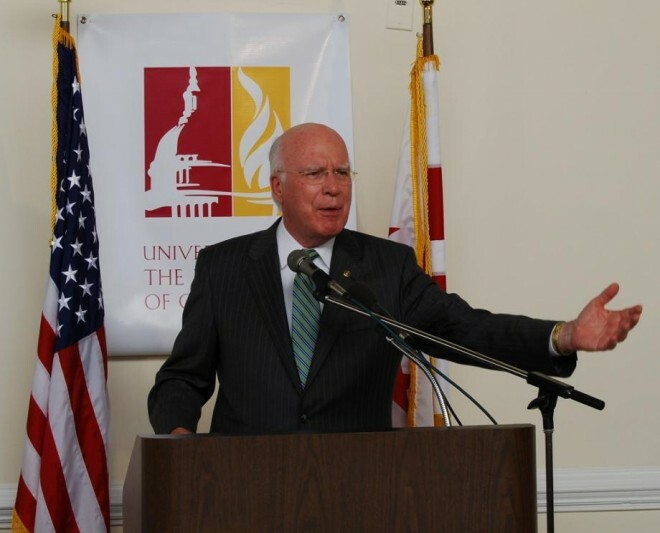 Far-reaching privacy legislation introduced by Sen. Patrick Leahy (D-Vermont) remains stalled for lack of GOP support. Five months ago, Senate Judiciary Committee Chairman Patrick Leahy (D-Vermont) introduced a bill to update the nation’s privacy laws to protect citizen’s data stored in the cloud from warrantless searches. The move was backed by tech powerhouses including Google and Microsoft, though law enforcement opposes restricting their power to easily get data in Gmail and Hotmail. Five months later, the bill remains in the ether, without a hearing, for the lack of a single Republican senator backing Leahy’s measure to require police to get a warrant to search data stored on any online service if that data is older than six months. “He is trying to shore up bipartisan support,” Erica Chabot, a Leahy spokeswoman, said in a telephone interview. Friday is the 25-year anniversary of the law that Leahy’s bill would dramatically amend. Civil rights groups had been anticipating the anniversary celebration at the Capitol Congressional Visitors Center on Tuesday would include some announcement of advancement of the Leahy proposal. Leahy’s bill would amend the Electronic Communications Privacy Act. Adopted when CompuServe was king, ECPA allows the government to acquire a suspect’s e-mail or other stored content from an internet service provider without showing probable cause that a crime was committed, as long as the content had been stored on a third-party server for 180 days or more. EPCA, whose main sponsor 25 years ago was Leahy, was adopted at a time when e-mail, for example, wasn’t stored on servers for a long time. Instead it was held there briefly on its way to the recipient’s inbox. E-mail more than 6 months old was assumed abandoned, and that’s why the law allowed the government to get it. At the time there wasn’t much of any e-mail to get because a consumer’s hard drive — not the cloud — was their inbox. But technology has evolved, and e-mail often remains stored on cloud servers indefinitely, in gigabytes upon gigabytes — meaning the authorities may access it without warrants if it’s older than six months. Civil rights groups beginning Tuesday will celebrate the ECPA anniversary to lobby for change and to point out that the law which once passed to protect Americans’ privacy has eroded due to the advancement of technology. Oddly, despite the recent rise of the libertarian-leaning Tea Party faction of the Republican Party, no Republican has decided publicly that privacy protection of Americans’ online communications is a winning issue. However, whether the bill would ultimately pass even with GOP support is unclear, and the White House maintains that warrants for such data are not required. Still, there is at least bi-partisan support for proposed legislation that for the first time would explicitly require authorities to obtain a court warrant to get geolocational information of a suspect’s movements. That proposal remains sidelined, however, as the U.S. Supreme Court is to hear a case next month testing the government’s position that no warrant is required for that geolocation data.